Having Fun at Home: Out-of-Control Popcorn Popper! Here'a fun idea for a rainy day! 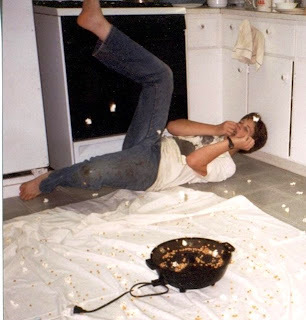 Spread a sheet on the floor in your kitchen; take the lid off of a popcorn popper (the tall hot air blowing kind are probably best for safety reasons) and gather your crowd of kids around the popper to try to catch the pieces of popcorn in their mouths. Lots of fun! What a fun idea! I am definitely going to file that away for a rainy day.